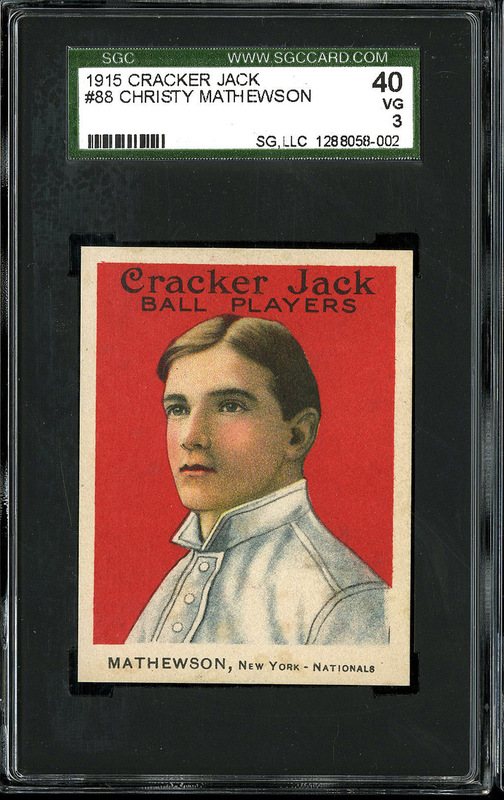 Back when Cracker Jack itself was young, the company cemented its baseball popularity with consecutive, near-identical sets of AL, NL, and Federal League stars: 1914 (144 cards) and 1915 (176 cards). That era's business and wartime context made them significant beyond being "just" 100 year-old cards. Three pre-scandal Black Sox appear in the set, including Shoeless Joe Jackson; he's one reason PSA called the 1914 set "nearly impossible to complete...even with unlimited funds"
Christy Mathewson's already one of the key cards, but his pose change rates as the sets' most significant variation. 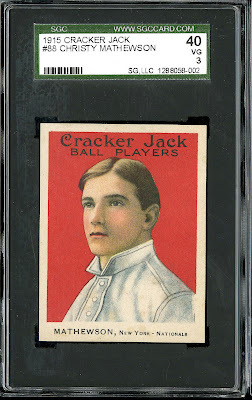 Card backs give a player bio and determines whether a given card's 1914 ("set of 144") or 1915 ("set of 176"). 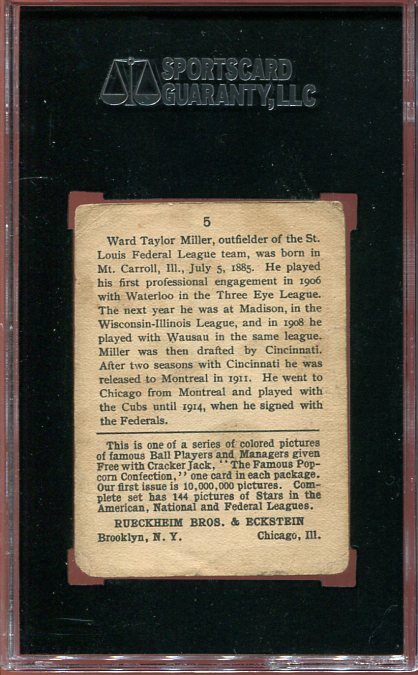 The "Three Eye League" mentioned on Miller's card was a minor league of teams from Iowa, Illinois, and Indiana, and fielded good talent for several decades. 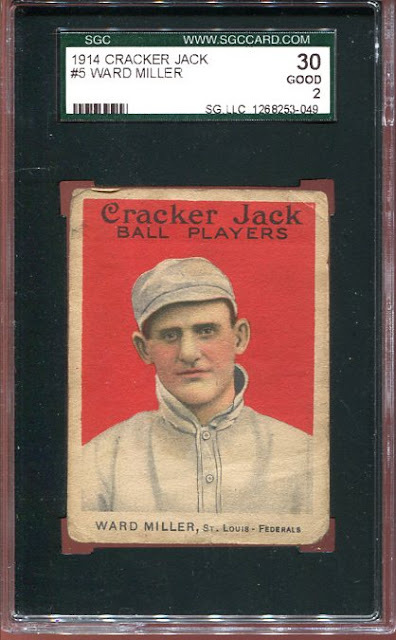 Note the production company's Rueckhein & Eckstein, since Cracker Jack was just a product in 1914. They renamed to the Cracker Jack Company prior to their purchase by Borden in 1964. Value: 1914 singles came on thin, semi-transparent paper and show damage easily. Low-grade singles cost $20-40, with prices in the hundreds for star players. Fakes / reprints: So many have reprinted Cracker Jacks that I've personally struggled to separate ungraded fakes from authentic cards. 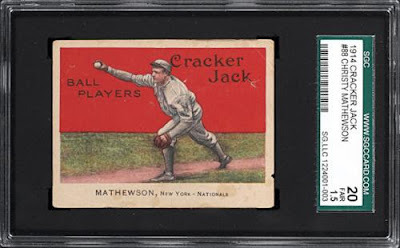 The thicker stock used for 1915 holds up better than 1914 and is easier to find, so I recommend getting a type card from that set.